Looking for Wi-Fi to use your computer on the go? Your cell phone might be the answer. While it may seem as if Wi-Fi is available everywhere, sooner or later you will go somewhere Wi-Fi is not. You still need to get on the Internet. What are you to do? Well, you may have a solution right in your pocket: a cell phone. Many cell phones let you turn your cellular connection to the Internet into a Wi-Fi connection for other devices. This is called creating a "hotspot." Your cell phone will show as a Wi-Fi network that others can join. 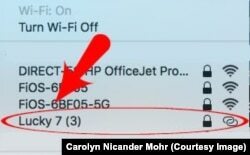 Connecting a tablet or computer to that hotspot is called "tethering." Using your phone as a Wi-Fi hotspot can help when you want to share your phone's Internet connection with your computer or tablet or someone else’s. Or perhaps there is an available Wi-Fi network but you are not sure the connection is secure. Using your phone as a hotspot will let you avoid unsecured Wi-Fi networks. Family car trips could be more fun if you use your phone's hotspot to connect a tablet to the Internet. You may be able to avoid paying a fee for your tablet's cellular plan by tethering your tablet. Maybe your home or office has a power outage and you need to use the Internet. 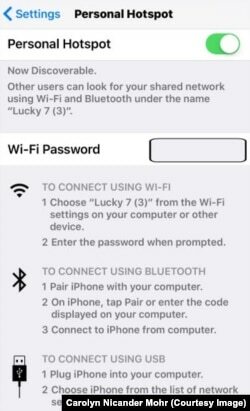 Connect your laptop or tablet to the Wi-Fi hotspot on your phone. 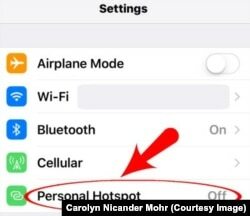 To turn your iPhone into a hotspot, go to Settings, then Personal Hotspot. The next screen will let you set a password. Do not skip this step (see below). The name of your network is the name you have given to your phone. Slide the switch to on and follow the directions that appear. You can use your Android phone as a hotspot if it is running Android 2.2, or later operating systems. Your phone and carrier must also permit tethering. To turn your Android phone into a hotspot, go to Settings, then Mobile Hotspot & Tethering. Tap on Mobile Hotspot to turn it on, set the name of your network and set a password. You connect a computer or tablet to your phone's Wi-Fi hotspot just as you would connect to any other Wi-Fi network. Select the name of your phone's network, enter the password and connect. Some phones also permit you to tether using a cable and/or Bluetooth. Before you start using your phone as a hotspot, there are some things you need to know. When your phone is a hotspot, it is sharing your monthly data allotment with other devices. Tether only when you need it, so you can avoid running out of data before the end of the month. You also do not want your phone to become an open Wi-Fi network, free for anyone to use. Your data allotment could be used up in minutes! For that reason, you want to select a strong password and share it only with people you trust. Hotspots use a lot of power so your phone’s battery can run down quickly. If you are going to tether for a while, be sure to plug in your phone to charge while the hotspot is turned on. You will save battery power and data if you turn the hotspot off as soon as you are finished tethering. If you are in a place without a cell phone signal then your phone's hotspot will not connect a device to the Internet. 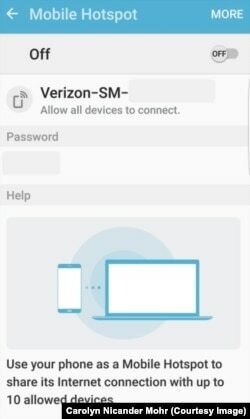 Make sure your phone and carrier both permit hotspot connections. And, remember, the more devices that are connected to your hotspot, the faster your data allotment will go. Carolyn Nicander Mohr wrote this report for VOA Learning English. Caty Weaver was the editor. Have you ever used your phone as a hotspot? Does your phone have this ability? When would you use a hotspot? Share your thoughts in the Comments Section below or on our Facebook page.